I promised I'd tell you about Audiobooks, didn't I? It was The Master And Margerita and The Third Policeman (both of which I'd read before, but liked the idea of listening to) and then I tried The Man In The Iron Mask (gave up not that far in - the pace was just wrong for exercising to, and I kept wanting to point out to Dumas that yes, he was being paid by the word, but really...). I'm now listening to The Pickwick Papers, which I'm enjoying to a degree that surprised me. I read it as an 11 year old, but it's more fun 40 years on. The 92nd Street Y, realising that they'd sold out and that people were still calling them for tickets to the event on the 21st of June, where Lev Grossman is interviewing me, have just got in more staff for the night and opened up their not-normally-opened balcony. Which frees up another 200 seats. You'll want to get in quickly, I suspect. But as of right now there are tickets. If you're in LA on the 28th of June, you may already be going to see me being interviewed by Patton Oswalt at the Saban Theatre. You can get free tickets for the Late Late Show With Craig Ferguson at http://www.1iota.com/show/view/The_Late_Late_Show_with_Craig_Ferguson You want tickets for the 28th, easily spottable because it has a photo of me up on that day. Two types of tickets are available for the Neil Gaiman event: Orange tickets cost $29.55, include one signed copy of American Gods: The Tenth Anniversary Edition from the University Book Store, and grant admission to one person to the event. Signed books will be distributed at the event. Green tickets cost $5, and admit one person to the event. To purchase tickets, please call 1.800.335.READ or email steshab@uw.edu. Tickets available now. I got an email this morning asking me about Doctor Who, in response to an article in the UK magazine Private Eye (Private Eye always makes you feel like an insider, but as with the few other Private Eye articles I've read over the years that I've actually known anything about what was being written, their Doctor Who one was a mix of true things, things that weren't actually not true, and solid-sounding gossippy things that were actually not true at all), and I thought, you know, The Doctor's Wife airs today in New Zealand, which is a good cue to put out a call for questions. So next blog entry I'll spend answering your questions on my Doctor Who Episode. Ask questions here. The Hero Initiative is the first-ever federally chartered not-for-profit corporation dedicated strictly to helping comic book creators in need. Hero creates a financial safety net for yesterdays' creators who may need emergency medical aid, financial support for essentials of life, and an avenue back into paying work. It's a chance for all of us to give back something to the people who have given us so much enjoyment. For more information, visit www.HeroInitiative.org or call 818-776-1918.
we've made something special happen in the next Hero Comics Anthology. Sam Kieth and Mike Dringenberg and I get back together for the first time since Sandman 4, published in March 1989, 22 years ago. Which is a bit like getting the Beatles back together for another song, while they were still alive anyway, and about as unlikely. 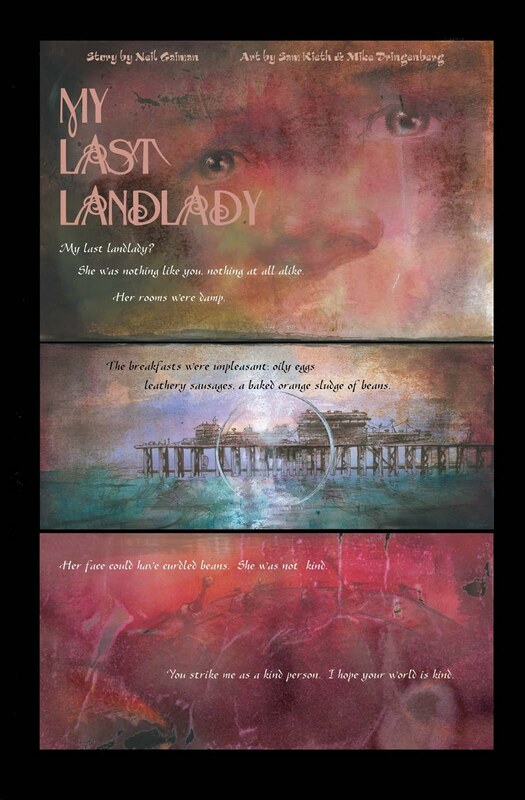 Sam and Mike make beautiful art around my creepy little tale of a seaside landlady and her unfortunate guest. Here's page 1.